The Arizona-Sonora Desert Museum Art Institute. 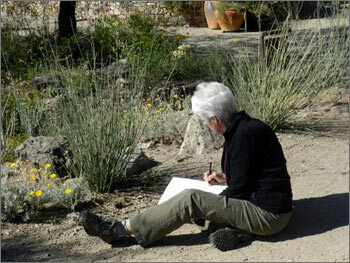 The ASDM Art Institute in Tucson does not offer a program specific to botanical art, but does offer several basic technique classes and the opportunity to experience the Museum's botanical bounty. Denver Botanical Gardens School of Botanical Art and Illustration. A highly respected school of botanical art, this rigorous program offers a wide spectrum of instruction for experienced artists and anyone interested in becoming a botanical artist. A Foundational Certificate in Botanical Art and Illustration is awarded with the completion of 15 core courses, and a Diploma in Botanical Illustration is awarded for additional coursework and completion of a portfolio. A scholarship program is available. The Botanical Art Program at Filoli. Classes for this program are held at the magnificent Filoli estate 30 miles south of San Francisco. A Botanical Art Certificate is offered that requires 180 classroom hours, completion of a portfolio, and a final project. Students can take classes without enrolling in the certificate program. American Society of Botanical Artists The ASBA maintains a listing of selected current botanical education opportunities available throughout the U.S. and a listing of certificate and diploma programs. They also provide contact information for a large number of botanical art instructors in the U.S. and abroad. Misinformation about copyright law abounds. As with anything involving federal law and regulation, it can quickly become a complex issue, but the basics are simple. Artists should have a basic understanding of how their work is protected by copyright law and how they can best protect their work from infringement. Here are a few links that will clarify much of the confusion about copyright and help artists quickly get the information they need to understand their copyright protections. Taking the Mystery Out of Copyright. Prepared by the Library of Congress for classroom use by teachers, this is an excellent, brief, and easily understood summary of what copyright is and how to navigate the rules of copyright protection. It includes a sections on how to determine "fair use" and how to register your work with the Copyright Office. The U.S. Copyright Office. The website of the Copyright Office is easily navigated and provides a wealth of information on the subject. The Home Page provides links to most anything an artist would need to know, starting with 'Register a Copyright'. Copyright and Fair Use/Stanford University Libraries. The site's overview page links to basic information about copyright law and practical matters, such as how to note your copyright on your artwork.